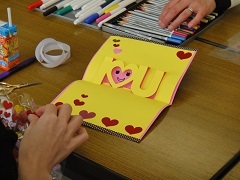 This month’s ICEC was a great opportunity to make something for Valentine’s Day. We made pop-up Valentine’s Day cards. Before we did that though everyone learned about how words are often shortened in English. 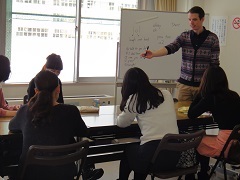 I hope it was a nice chance to learn English words that aren’t often taught in classes. The pop-up cards everyone made were great. I was very impressed by the originality of everyone’s creations. Great job and Happy Valentine’s Day! !